The former British colonies in the Caribbean, especially Guyana and Trinidad have some of the world’s best Indian food. The reason is simple – nearly half of the population of those two countries is Indian. How this happened is more complicated. The British abolished slavery well before America did. In the British Caribbean, it was abolished in 1838. However, by 1840 in Guyana, for example, sugar and rice production had fallen by 60% as the emancipated slaves refused to work for their former owners and migrated to cities and villages or farmed marginal lands. The British solved the problem in an interesting way. India was an important part of the British Empire at the time and in certain regions there was extreme poverty and a great surplus of labor. A program of indentureship was begun whereby Indians would be given passage to the Caribbean in exchange for 5-7 years of work. From 1840-1920, hundreds of thousands of Indians traveled to the New World – to Trinidad and Guyana in large numbers, but in significant numbers also to Jamaica and many of the French islands, as British entrepreneurs who traded in the indenture contracts found wider markets for the workers. The indentured laborers brought not only their customs and religions, but also they also brought their cuisine, which is still thriving today. 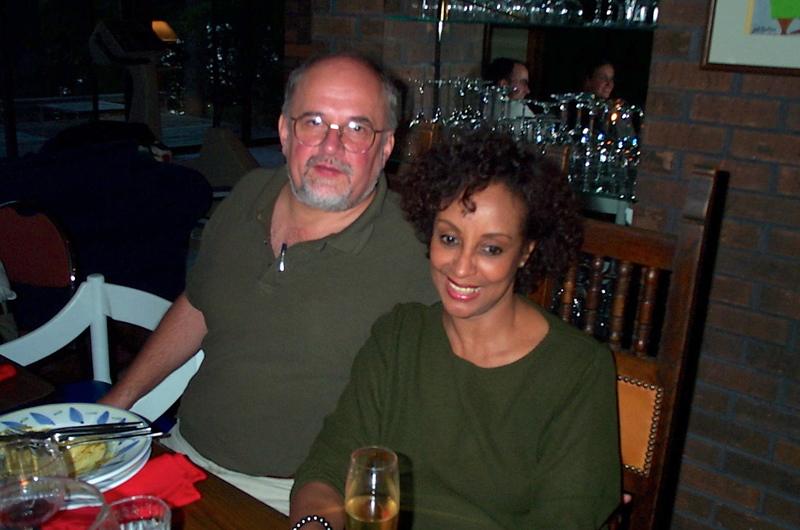 I have spent a great deal of time in Trinidad and Guyana working on educational projects. 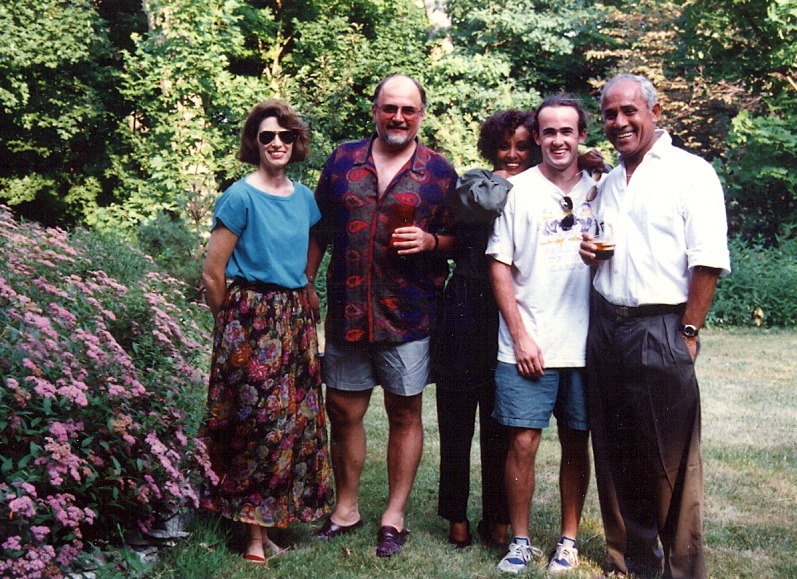 The wife of a good friend, Glenn Nafziger, made this wonderful curry dish for me many times. Another friend from Trinidad, Ainsley Timpow, insisted that I use only coconut milk in the recipe. It requires some time – not a 30 minute meal – but it is worth it. It makes for a great dinner party because the dish is very unique and can be made ahead of time. It also fills the house with the rich smell of curry and gets everyone in the mood for a great meal. Some might suggest serving the curry over rice, but more likely than not you would find the Trinidadians or Guyanese eating the dish with an Indian flatbread such as naan or roti. This is what I prefer and I will tell you how to make both. The roti is quicker, but sometimes gets smoke in the kitchen. The naan takes longer, but you bake it in the oven. You can decide. The recipe is for 12 servings, so I’m thinking “party”. Simply cut everything in half for a smaller group. 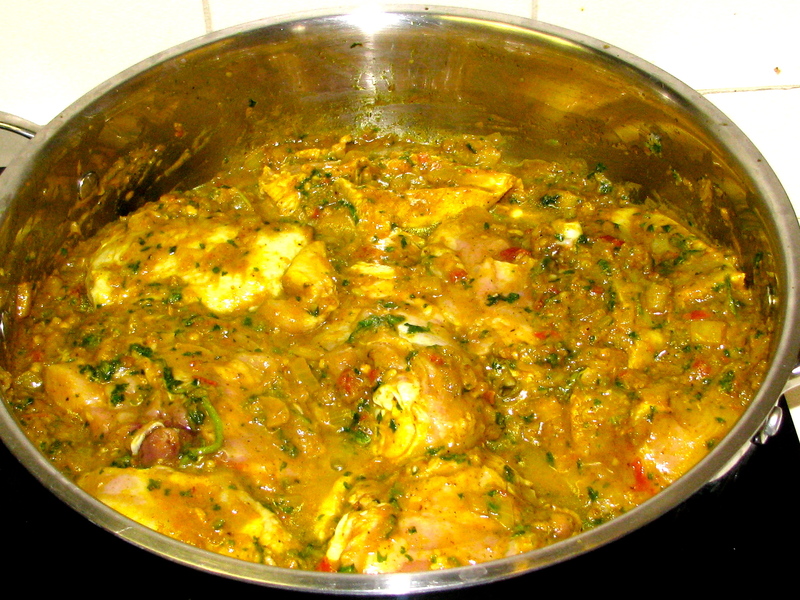 In general terms, the recipe entails (1) marinating the chicken, (2) making the curry paste, and (3) stewing. Time Required: 1 hr. prep, 3-4 hrs. marinating the chicken, 2 hrs. cooking. 2 (14-oz) cans regular coconut milk. Add the salt, black pepper, mustard, the quartered onion (you will use the diced onion later), tomatoes, garlic, jalapeno and cilantro to the bowl of a food processor. Pulse until coarsely chopped. Pat the chicken dry with paper towel, lightly salt and pepper and place in a large zip-lock bag. Pour the vegetable salsa over the chicken and close the bag. Massage the bag with your hands until the chicken is coated with the vegetables. Refrigerate the chicken and for at least 1 hour. When ready to start cooking, make the curry paste by whisking together the curry powder and 3/4 cup warm water in a mixing bowl. In a large, heavy pot, heat the oil over medium heat. Pour in the curry slurry and cook for a few minutes, stirring constantly. 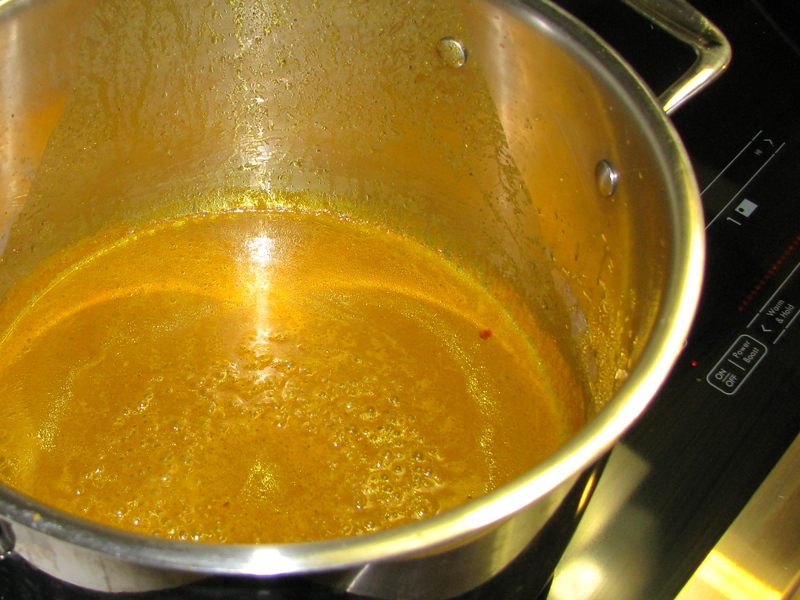 As the water evaporates, the curry slurry will darken slightly and thicken. 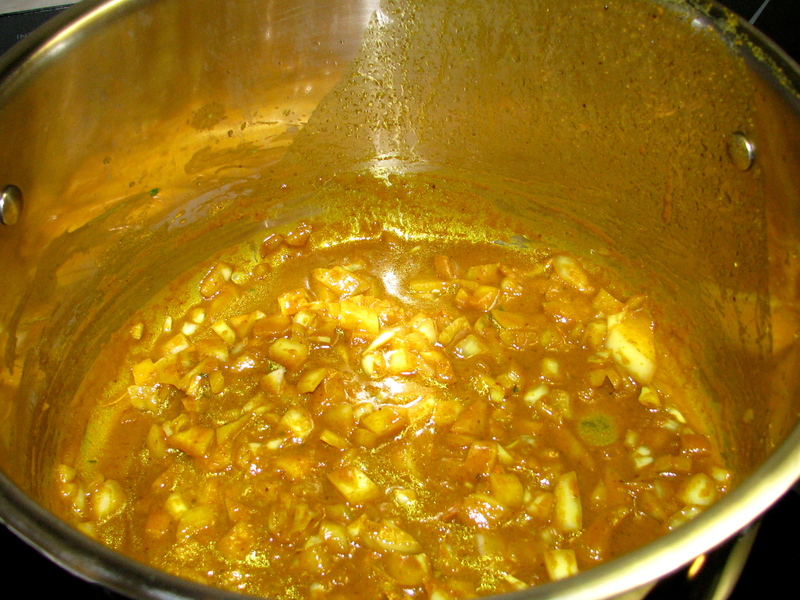 When the curry slurry has become a thick paste, add the diced onion and cook for 3-4 minutes until soft. Then add in the chicken and all the vegetables. Stir well to coat the chicken with the curry and cook for five minutes. Add the potatoes and coconut milk. Stir until evenly blended. Add 1 cup of water if needed to cover everything with liquid. Bring the mixture to a boil and then reduce the heat to a gentle simmer. Cook uncovered for about two hours, stirring occasionally, until the potatoes easily mash and the chicken is cooked through. Let the smell of the curry fill the house. 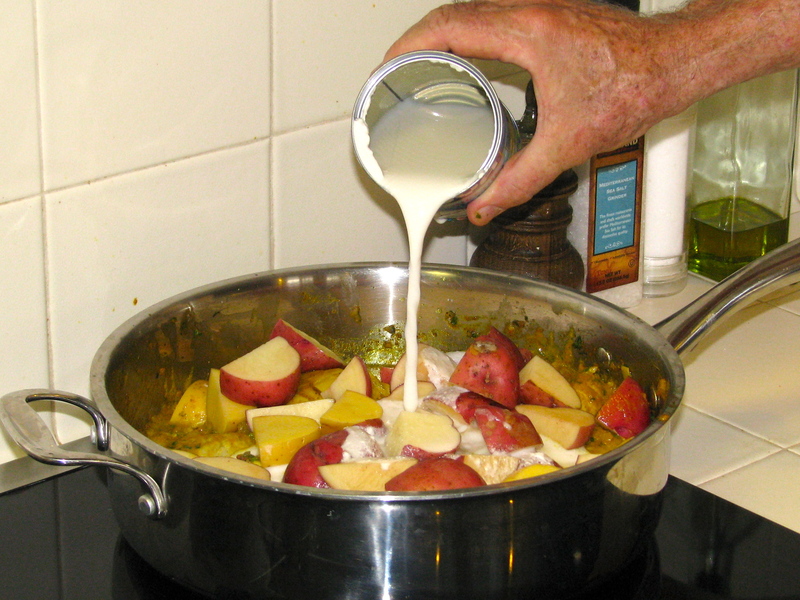 Before serving, use a wooded spoon and mash about a third of the potatoes against the side of the pot. This thickens the sauce. Taste and adjust seasonings, if necessary. This recipe is adapted from “The Joy of Cooking”(see our post on The Three Best Cookbooks). This was one of the great additions to their latest edition. Assuming that you have been practicing your pizza skills, this flatbread should be no problem. Time Required: 15 minutes prep, 2 hours for dough to rise, and 45 minutes to bake. Mix the flour, salt, and dry yeast in a bowl. Add yogurt and vegetable oil and stir. Gather the dough with your hands and knead for about 5-7 minutes until it becomes elastic and slightly warm. Put into a greased bowl, cover and let rise for about 2 hours. Put a pizza stone in the oven and set to 475 degrees. You have to allow one hour for the stone to properly heat up, so get this done while the dough is rising. Get a basket and some cloths to receive the breads. Roll out each ball into about an 8” x 10” shape, brush with melted butter and sprinkle with sesame seeds. After putting some corn meal on the peel, put the flatbread onto the peel, slide onto the pizza stone. 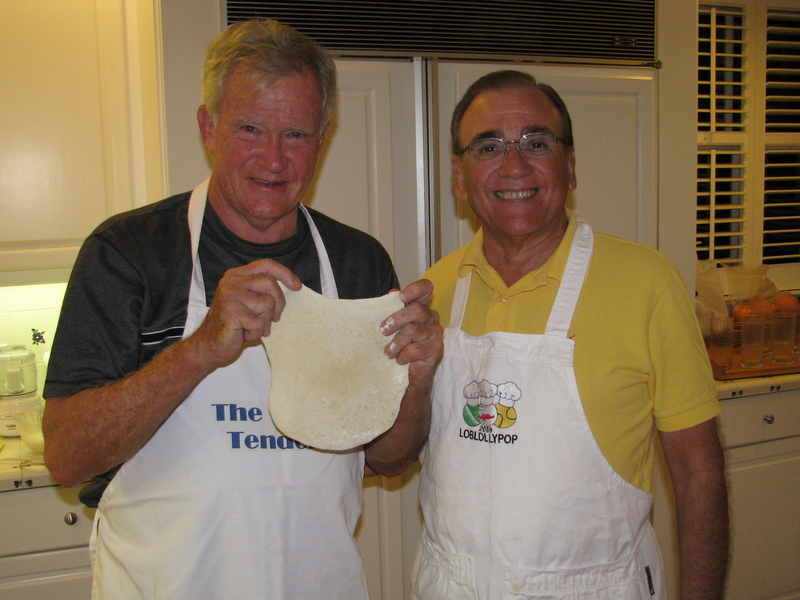 The corn meal helps the dough to slide easily, as you will find out. You may be able to get two flatbreads at a time on the stone. Remove and put in basket covered with cloth until serving. 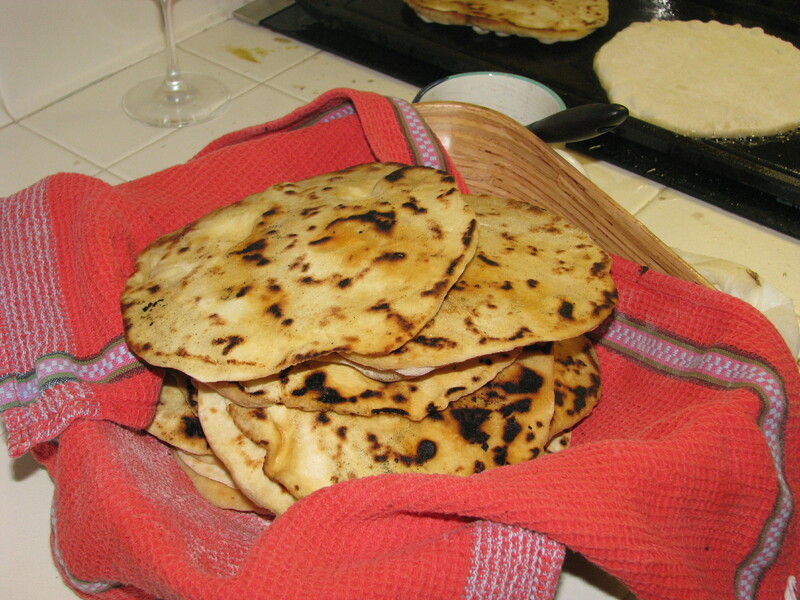 Instead of naan, you can make roti, another Indian flatbread that is popular throughout the Caribbean. Instead of yeast to leaven the bread, baking powder is used in the flour. In the U.S. you can buy “self-rising” flour, which is simply flour with baking powder and salt. It is very easy to make – how about one minute. Just add 1-1/2 tsp. of baking powder and 1/2 tsp. of salt for each cup of flour. Self-rising flour is used to make “quick breads”, called so because you don’t have to wait for the yeast to make the dough rise. Pancakes are the most common example of a quickbread and pancake mixes like Aunt Jemimah are nothing more than self-rising flour. The “rising” is caused by the chemical reaction between cream of tartar and sodium bicarbonate, the two ingredients of baking powder. Heat and water trigger the reaction producing carbon dioxide molecules, which get trapped in the dough causing it to expand. Mix the flour, baking powder and salt together in a bowl. Stir well. Add the oil and water, stir together briefly and gather together the dough in your hands and knead for about five minutes until the dough is smooth, elastic and slightly warm. 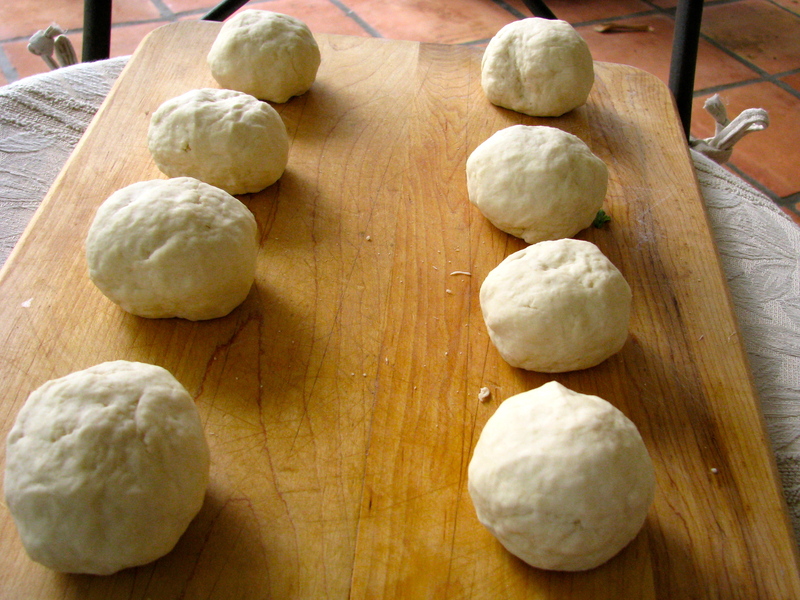 Divide the dough into 12 equal balls, put them back into the bowl, cover and let rest until ready to use. If it is going to be more than an hour, put them in the fridge, remembering to get them out in time to warm up to room temperature. If you have a griddle on the top of your stove, it will come in handy for making roti because you can do two or three at a time. If not, use your largest frying pan. 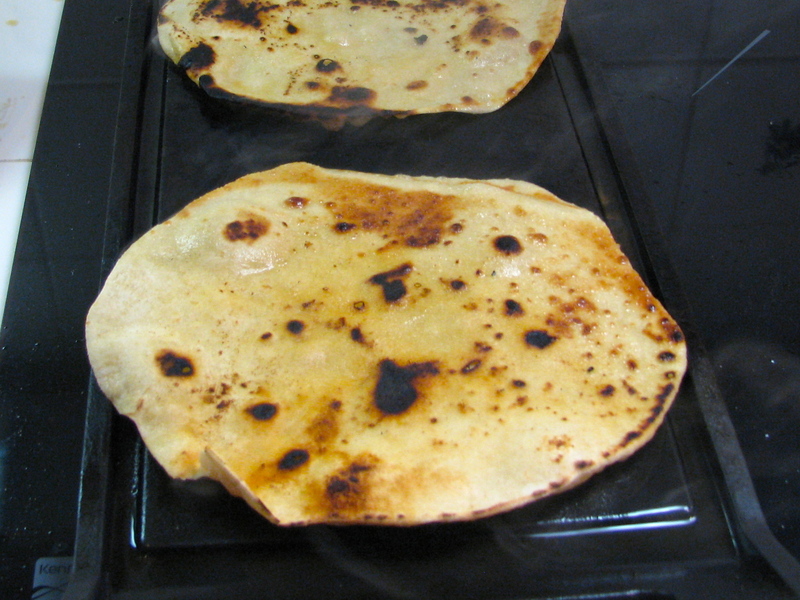 Turn heat to medium-high, but reduce if flatbreads start to burn. Roll out each ball into about an 8”x10” oval, brush olive oil on both sides and put on the grill or into the frying pan. Cook 1-2 minutes on each side until golden brown. You will see the baking powder go into action. Put finished breads in a basket lined and covered with cloth to keep everything warm. People will love some of the history behind this dish, so be a true Bravado chef and tell them all the story. Have some beer available – it always goes well with curry. Look for Carib, a great Trinidadian beer or Red Stripe from Jamaica. The arugula salad with melon, which we discovered in Italy, pairs well with the curry, as does any green vegetable. If you really want to knock their socks off, serve coconut tapioca pudding for dessert. I will tell you how to make that next week. Bill I love the history lesson and the meal is fabulous. I am a big fan of Naan. and thanks for the promotion to chef it is a real stretch.